Abstract. Growth factor-stimulated DNA synthesis in a variety of cell lines has been shown to be decreased after overnight (or longer) treatment with the 3-hydroxy-3-methylglutaryl CoA reductase inhibitors, the statins. Although this anti-mitogenic effect had been presumed to be the result of the impairment of Ras lipidation, a stable modification (T1/2 approximately 20 h), this study provides new data demonstrating that brief (approximately 1 h) pretreatment of rat vascular smooth muscle cells with 100 μM pravastatin before platelet-derived growth factor-BB (PDGF-BB) stimulation results in attenuation of DNA synthesis through a Ras-independent mechanism. PDGF-BB-stimulated PDGF-β receptor tyrosine phosphorylation, Ras activity, and mitogen-activated protein/extracellular signal-regulated kinase activity are unaffected by from 10 min to 1 h of pravastatin incubation, while Raf activity is markedly increased after 1 h of pravastatin. Phosphatidylinositol-3 kinase activity and phosphorylation of its downstream effector Akt are decreased after 1 h pravastatin incubation. Rho is stabilized by pravastatin, and ADP-ribosylation of Rho by C3 exoenzyme decreases PDGF-stimulated phosphatidylinositol-3 kinase activity, mimicking the effect of pravastatin on this signaling protein. Levels of the cyclin-dependent kinase inhibitor p27Kip 1 are increased when cells were preincubated with pravastatin for 1 h and then exposed to PDGF, and apoptosis is induced by pravastatin incubation times as short as 1 to 4 h. Thus, short-term, high-dose pravastatin inhibits vascular smooth muscle cell growth and induces apoptosis independently of Ras, likely by means of the drug's effect on p27Kip 1, mediated by Rho and/or phosphatidylinositol-3 kinase. This work demonstrates for the first time that the statins may be therapeutically useful when applied for short periods of time such that potential toxicity of long-term statin use (such as chronic Ras inhibition) may be avoided, suggesting future therapeutic directions for statin research. The 3-hydroxy-3-methylglutaryl CoA (HMG-CoA) reductase inhibitors, or statins, block mevalonate production, the ratelimiting step in cholesterol biosynthesis. As a salutary but unexpected consequence of the use of these medications in hyperlipidemic patients, a decrease in vasculopathy has been observed in renal and cardiac transplant patients. This important clinical observation has been shown to involve inhibition of vascular smooth muscle (VSM) cell proliferation, independent of serum LDL. Such an effect, at least in part, could have been anticipated by the work of many investigators who found that inhibition of the formation of isoprenoids, precursors of sterol synthesis, played an important role in altering the processing of signaling proteins that require lipidation, such as Ras (1). However, while the statins appear to have some effect on transplant coronary vasculopathy (2), unsuccessful efforts have been made to use statins to block other processes characterized by VSM proliferation, such as restenosis after coronary angioplasty (3). Furthermore, the chronic use of these agents is also limited by both real (in the case of skeletal muscle damage) and potential toxicity, when used over long period of time, likely due to inhibition of lipidation of key signaling proteins in a variety of somatic cells. The available studies on statin inhibition of mitogenesis have focused on long-term (overnight or longer) statin incubation, where modification of signaling protein lipidation (particularly of Ras) likely comes into play (1). Examination of early events that may be affected by short-term (less than approximately 20 h) exposure to HMG-CoA reductase inhibitors has not been reported. We asked whether short-term pravastatin incubation can cause growth inhibition and, if so, whether such inhibition occurs through signaling mechanisms that have been established for the anti-mitogenic effects of long-term statin exposure. We now show that short-term, highdose application of pravastatin in a tissue culture VSM cell model has no effect on Ras-GTP loading, but rather causes modification of a signaling pathway that implicates the cyclindependent kinase (cdk) inhibitors, as well as phosphatidylinositol-3 kinase (PI3K) and the small GTPase Rho, as the mediators of the anti-mitogenic and pro-apoptotic effects of shortterm pravastatin. Recombinant human PDGF-BB was obtained from Upstate Biotechnology, Inc. (Lake Placid, NY). Rabbit polyclonal anti-PDGF-β receptor and anti-C-Raf, mouse monoclonal anti-phosphotyrosine and anti-p27Kip 1, and sheep polyclonal anti-Rho (recognizing both RhoA and RhoB) antibodies were obtained from Santa Cruz Biotechnology (Santa Cruz, CA). Rabbit polyclonal anti-phospho-Akt (Thr308) antibody and the mitogen-activated protein (MAP) kinase assay components were obtained from New England Biolabs (Beverly, MA). 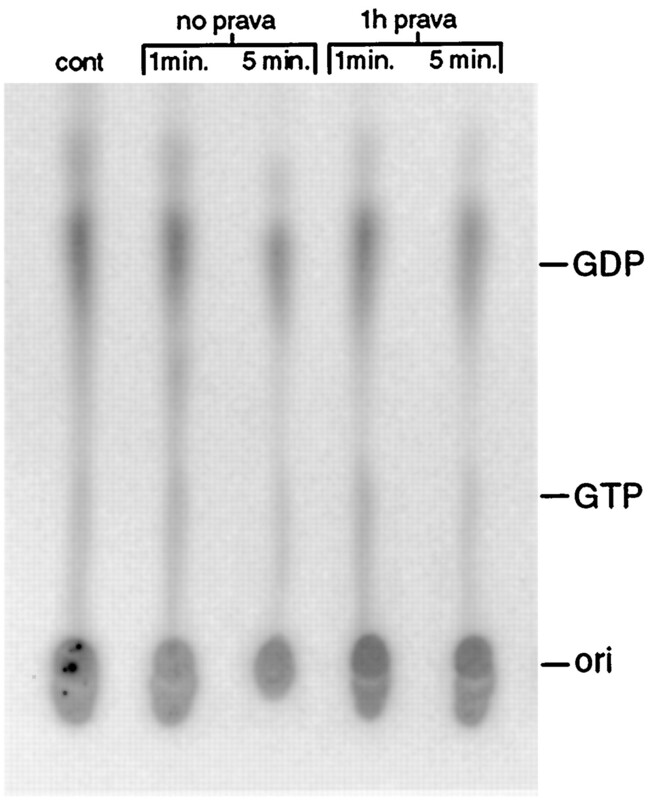 Goat anti-mouse and anti-rabbit horseradish peroxidase-linked IgG were obtained from BioRad (Richmond, CA). Rat monoclonal anti-v-H-Ras was obtained from Calbiochem (San Diego, CA). C3 exoenzyme was obtained from List Biological (Campbell, CA). Reagents for the enhanced chemiluminescence system, [3H]-thymidine, γ-[32P]-ATP, and [35S]-methionine, were obtained from Amersham (Arlington Heights, IL). Pravastatin was obtained from Bristol-Myers Squibb (Princeton, NJ) and solubilized in water. The Apo-TACS reagents for in situ terminal deoxynucleotidyl transferase (TdT)-mediated nick end labeling (TUNEL) assays were obtained from Trevigen (Gaithersburg, MD). All other reagents were from Sigma (St. Louis, MO). Cultures of A10 aortic VSM cells were obtained from American Type Culture Collection (Rockville, MD). The cells were maintained as described (4) and were used between passages 15 and 25. The cells were growth-arrested by placing them in serum-free quiescence medium containing Dulbecco's modified Eagle's medium, 20 mM Hepes, pH 7.4, 5 μg/ml transferrin, 0.5 mg/ml bovine serum albumin, penicillin (50 U/ml), and streptomycin (50 U/ml). Cultured VSM cells were harvested, plated onto 24-well plates, and grown to confluence. The confluent monolayers were then placed in quiescence medium for an additional 2 d. Cells were then exposed to growth factors as indicated, and [3H]-thymidine incorporation was assessed as described previously (5). Cells were grown to confluence in 6-cm culture dishes and serumdeprived. After treatment with pravastatin and PDGF-BB, the cells were washed with phosphate-buffered saline (PBS) and lysed in lysis buffer and the supernatant was immunoprecipitated and/or Westernblotted as described in the study by Weiss et al. (4). Cells were grown to confluence on 10-cm culture dishes and serum-deprived. PDGF-BB and/or pravastatin were added at the indicated concentrations and times to the medium. The cells were washed three times with PBS, and Raf and MAP kinase activity assays were performed as described (4). Cells were grown to confluence on 6-cm culture dishes, serum-deprived, and incubated in medium containing carrier-free [32P]-orthophosphate (10 mCi/ml per dish) for 2 h and then pravastatin was added for the last hour. After stimulation with PDGF-BB for 1 to 5 min, the cells were lysed in solubilization buffer (50 mM Tris-HCl, pH 7.5, 20 mM MgCl2, 150 mM NaCl, 0.5% [vol/vol] Nonidet P-40, 20 μg/ml aprotinin, 1 mM Na3VO4), removed, and, after pre-clearing with charcoal, incubated with agarose-linked anti-v-H-Ras antibody. The samples were centrifuged and the pellet was washed three times in solubilization buffer and two times in wash buffer (50 mM Tris-HCl, pH 7.5, 20 mM MgCl2, 150 mM NaCl). The samples were eluted with elution buffer (40 mM Tris-HCl, pH 7.5, 40 mM ethylenediaminetetra-acetic acid, 4% [wt/vol] sodium dodecyl sulfate, 1 mM GDP, 1 mM GTP), spotted on cellulose thin-layer chromatography (TLC) plates, and developed in 0.75 M KH2PO4, pH 3.4 (6). Ras-GTP and Ras-GDP were identified using nonradioactive GTP and GDP standards run on the same plate and visualized by ultraviolet light. VSM cells were grown to confluence on 6-cm culture dishes and serum-deprived. The cells were preincubated with pravastatin at the times indicated before stimulation for 10 min with PDGF-BB. 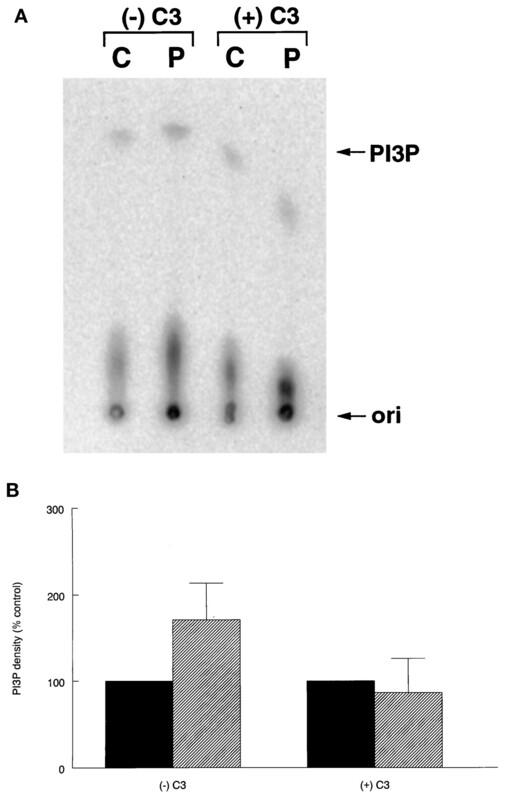 The cells were washed three times in PBS, and PI3K activity was assessed as described (7). VSM cells were grown to confluence in 10-cm tissue culture dishes and washed with PBS. 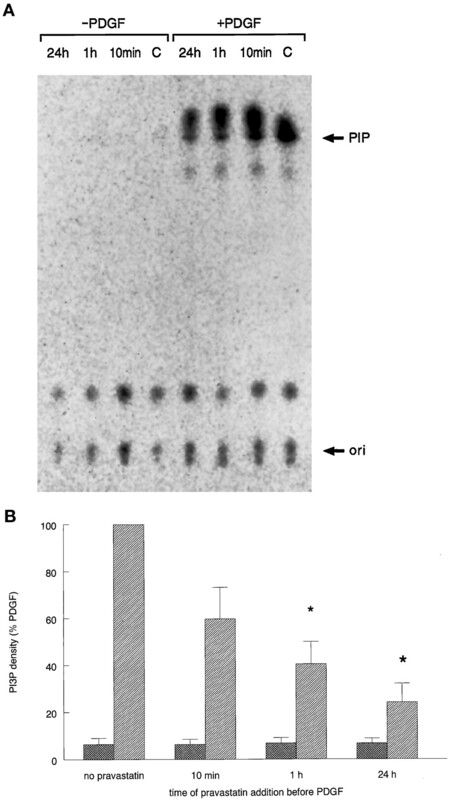 Scraping buffer (114 mM KCl, 15 mM NaCl, 5.5 mM MgCl2, and 10 mM Tris-HCl, pH 7.4) was added in the presence or absence of C3 exoenzyme (5 μg/ml), and the cells were scraped with a rubber policeman and centrifuged at 2000 rpm for 5 min at room temperature. The pellets were resuspended in complete culture media in 6-cm tissue culture dishes and incubated overnight, and PI3K activity was assessed as described above. VSM cells were grown to confluence on 6-cm culture dishes and serum-deprived. Then cells were incubated for 2 h with 110 μCi of [35S]-methionine per ml in Dulbecco's modified Eagle's medium lacking methionine that was supplemented with 2% fetal bovine serum. Pravastatin was added to cells 1 h after [35S]-methionine addition. After an additional hour, the cells were washed twice with warm PBS and then quiescent media with PDGF-BB (30 ng/ml) was added to chase the [35S]-methionine label for various times. At the indicated time intervals (after complete medium addition), the cells were washed three times with PBS and lysed in lysis buffer (50 mM Hepes, 1% Triton X-100, 10 mM sodium pyrophosphate, 100 mM NaF, 4 mM ethylenediaminetetra-acetic acid, 1 μg/ml aprotinin, 2 mM phenylmethylsulfonylfluoride, 2 mM Na3VO4). The lysate was removed with a rubber spatula and passed through a 25-gauge syringe to ensure complete lysing. The lysate was centrifuged at 12,000 rpm, and the protein concentration of the supernatant was determined by absorbance at A595. Equal protein concentrations of lysate were incubated with Rho antibody overnight. The immunocomplex was incubated with protein A-Sepharose beads, centrifuged, and washed twice with lysis buffer. The pellet was resuspended and electrophoresed. The gel was then fixed (glacial acetic acid:methanol:water, 10:20:70, vol/vol/vol), soaked overnight (20% methanol, 3% glycerol), dried, and visualized with a PhosphorImager. Non-serum-starved VSM cells were harvested from 12-mm glass coverslips. After addition of 20 μl (100 μM) of pravastatin at the indicated incubation times, the cells were fixed in 3.7% buffered formaldehyde for 10 min, washed twice with PBS, dried, and stored in CytoPore (Trevigen) at 4°C overnight. The coverslips were washed twice with water, immersed in quenching solution (45 ml of methanol, 5 ml of 30% hydrogen peroxide) for 5 min, washed again with water, and immersed in TdT labeling buffer (Trevigen). The cells were covered with 50 μl of labeling reaction mix (B-dNTP, TdT, TdT labeling buffer) and incubated at 37°C for 1 h in a humidity chamber. The coverslips were immersed in 1 × TdT stop buffer (Trevigen) and washed. The cells were covered with 50 μl of Detection Mix A (Trevigen) and incubated for 1 h in a humidity chamber. After washing slips twice in PBST (PBS, 0.05% Tween 20) and once in water, the samples were covered with 50 μl of TACS Blue Label (Trevigen) for 4 min and washed twice in water. After staining, the cells were counterstained with Nuclear Fast Red, dehydrated in 95% ethanol, and mounted onto the glass slides. Data are expressed as percentage of blue cells in the stained slides. All biologically active Ras proteins are modified by polyisoprenylation (8). After carboxyl methylation of its farnesylated cysteine, fully processed Ras is stably anchored to the cell membrane (9) with a half-life of approximately 20 h (10). Thus, short-term (less than 20 h) incubation of cells with an HMG-CoA reductase inhibitor would not be expected to reduce membrane-bound Ras and thus Ras catalytic activity. Surprisingly, however, we found that incubation of serumstarved VSM cells with 100 μM pravastatin from 10 min to 1 h before PDGF-BB addition significantly inhibited PDGF-stimulated [3H]-thymidine incorporation (Figure 1A). As has been shown in other systems using a variety of statins (11,C12,C13), there was further inhibition, to 71%, when pravastatin was present for 24 h before PDGF stimulation (Figure 1A). The inhibition of PDGF-BB-stimulated DNA synthesis was pravastatin dosedependent from 1 to 100 μM, when pravastatin was added 1 h before this growth factor (Figure 1B). To examine how much time was actually required for pravastatin to exert its inhibitory effect on growth, we removed pravastatin from the cells at various times after its addition (Figure 1C). Pravastatin need be present for only 1 h, and subsequently washed off, before the addition of PDGF-BB to exert its inhibitory effect. The inhibitory effect of 1 h pravastatin incubation was completely reversed by the addition of mevalonate (1 mM), the catalytic product of HMG-CoA reductase on HMG-CoA, when added 4 h before PDGF-BB, demonstrating that the mitogenic inhibition of pravastatin at times quite unlikely to be affecting Ras remain specific to the drug's effect on HMG-CoA reductase. Both short- and long-term incubation of vascular smooth muscle (VSM) cells with pravastatin decreases platelet-derived growth factor-BB (PDGF-BB)-induced DNA synthesis. (A) Confluent, VSM cells were serum-starved for 2 d and incubated with pravastatin (100 μM) for the indicated times before addition of PDGF-BB (30 ng/ml) for 24 h ([UNK]). Control cells (▪) were incubated with pravastatin (where indicated) but were not stimulated with PDGF. (B) Serum-starved cells were incubated for 1 h with pravastatin at the concentrations indicated before addition of PDGF-BB (30 ng/ml) for 24 h. (C) Serum-starved cells were incubated with pravastatin (100 μM) for the times indicated. At the end of the indicated time period, the cells were washed twice with phosphate-buffered saline, to remove pravastatin, and PDGF-BB (30 ng/ml) was then readded for 24 h. PDGF-BB was added 1 h after pravastatin in all cases where pravastatin was added. In the “no wash” cells, pravastatin was not removed after its addition. [3H]-Thymidine (1 μCi/well) was added for the last 8 to 11 h of incubation, and TCA-precipitable radioactivity was assessed by liquid scintillation. Data are expressed as average ± SEM of three wells per data point. P < 0.05 compared to PDGF alone. The results shown are representative of two to four separate experiments. We next examined elements of the PDGF mitogenic signaling cascade to ascertain which are being affected by short-term pravastatin administration. Early events after binding of PDGF to its receptor are set in motion by autophosphorylation of the PDGF receptor on tyrosine residues, with subsequent activation of a variety of cytoplasmic signal transfer proteins (14). To rule out an effect of short-term pravastatin incubation on early PDGF receptor events, we examined the effect of pravastatin on receptor tyrosine phosphorylation after PDGF stimulation. Serum-starved VSM cells were preincubated with pravastatin for 1, 3, and 24 h and then subjected to PDGF-BB stimulation for 10 min. The cell lysates were immunoprecipitated with antibody to the PDGF-β receptor, electrophoresed, and immunoblotted with phosphotyrosine antibody. Control cells and cells incubated with pravastatin alone, in the absence of PDGF stimulation, did not cause PDGF-β receptor tyrosine phosphorylation, whereas in cells stimulated with PDGF, either in the presence or absence of 100 μM pravastatin, the receptor showed a similar degree of tyrosine phosphorylation at 1 and 3 h (Figure 2). Tyrosine phosphorylation of the PDGF receptor was reduced after 24 h of pravastatin incubation, consistent with a previous report (15). Thus, short-term pravastatin incubation does not affect PDGF-β receptor tyrosine phosphorylation and, by inference, receptor/ligand binding. Tyrosine phosphorylation of the PDGF-β receptor is unaffected by short-term pravastatin incubation. VSM cells were grown to confluence and serum-starved as in Figure 1. Cells were exposed to 100 μM pravastatin (P1, P3, P24) for the times indicated (in hours) before addition of PDGF-BB (30 ng/ml) (where indicated) for 10 min. Control cells (C) did not receive pravastatin. After immunoprecipitation with PDGF-β receptor antibody, the lysate was electrophoresed and Western blotted with phosphotyrosine antibody. The band representing the PDGF-β receptor is indicated by an arrow. The results shown are representative of three separate experiments. Upon receptor autophosphorylation, signal transfer proteins are recruited and become activated, generally by means of tyrosine phosphorylation (14). Several of these proteins are responsible for early activation of Ras. Ras requires farnesylation to remain tethered to the cell membrane, where it subsequently recruits Raf to the membrane for activation, leading to subsequent activation of the mitogen-activated protein/extracellular signal-regulated kinase (MAP/ERK) signaling pathway (16). Long-term exposure to the HMG-CoA reductase inhibitors is known to inhibit lipidation of such second-messenger proteins as Ras, which becomes associated with GTP upon activation, but whether short-term exposure causes similar Ras changes is not known. Serum-starved VSM cells were placed in medium supplemented with [32P]-orthophosphate, preincubated with pravastatin for 1 h, and stimulated for 1 or 5 min with PDGF-BB. After immunoprecipitation of the lysate with monoclonal anti-v-H-Ras antibody (which recognizes the p21 translational products of the H-, K-, and N-Ras genes [(17)], radiolabeled Ras was assessed by thin-layer chromatography, and spots on the chromatography plate representing GTP and GDP were identified using nonradioactive standards. PDGF-BB increased Ras-GTP association in control cells after 1 min of PDGF stimulation, and there was no diminution of Ras-GTP loading after 1 h preincubation of the cells with pravastatin (Figure 3). Thus, short-term pravastatin exposure has an anti-mitogenic effect in VSM cells without decreasing activation of Ras. PDGF-BB stimulated Ras-GTP association is not inhibited after 10 min and 1 h of pravastatin incubation. VSM cells were grown to confluence and serum-starved as in Figure 1. The medium was replaced with phosphate-free medium for 2 h before the addition of [32P]-orthophosphate for 3 h. Pravastatin (100 μM) was then added where indicated for 1 h before the cells were stimulated with PDGF-BB (30 ng/ml) for 1 or 5 min before cell lysis. Control cells were not stimulated with PDGF. The lysate was immunoprecipitated with Ras antibody and separated by thin-layer chromatography, and the plate was visualized with a PhosphorImager. Mobilities of nonradioactive GTP and GDP standards were visualized by ultraviolet light. The results shown are representative of two separate experiments. We next asked whether another signal transfer protein that is initiated by binding to activated receptor and is required for PDGF-induced growth is being modulated by short-term pravastatin exposure. PI3K is activated by the stimulated PDGF receptor and has been shown to be required for DNA synthesis and trafficking by PDGF (18,19,20) in several cell lines. There appear to be distinct binding sites on the PDGF receptor for PI3K and for upstream elements of the Ras/Raf/MAPK pathway (19,20,21). We thus examined the activity of PI3K as a possible mediator of growth inhibition by short-term pravastatin incubation. VSM cells were serum-starved for 2 d, exposed to pravastatin for 10 min to 24 h before PDGF-BB stimulation for 10 min, immunoprecipitated with anti-phosphotyrosine antibody, and the resulting immunoprecipitate was assessed for PI3K activity (Figure 4A). After incubation of the cells with pravastatin for 10 min, there was a 43% decrease in PI3K activity, and by 1 h PI3K activity was reduced by 65% of maximum (Figure 4B). To confirm the PI3K assay results, we next examined the phosphorylation of Akt, a downstream molecule in the anti-apoptotic pathway of PI3K (22,23). 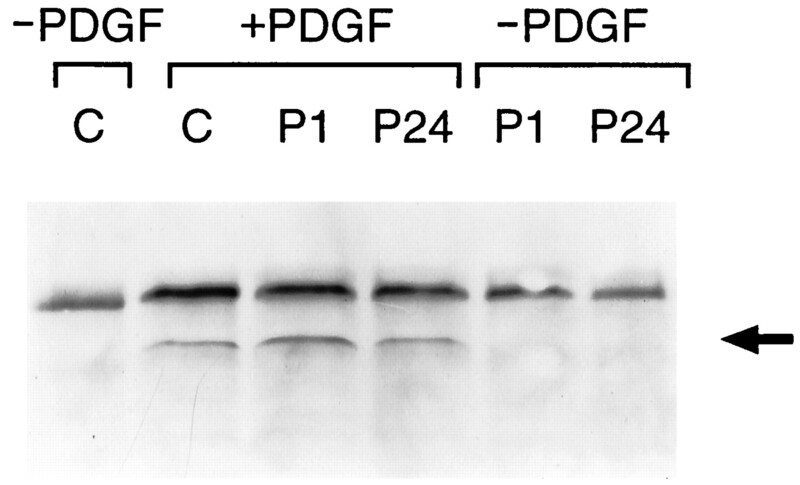 The cells were preincubated with pravastatin for 1 h and subsequently exposed to PDGF for an additional 1 or 24 h, and then Western-blotted with phospho-Akt antibody. After 1 h preincubation with pravastatin, phospho-Akt was inhibited when the cells were exposed to PDGF for either 1 or 24 h (Figure 5), consistent with our PI3K activity assay results (Figure 4). Pravastatin alone increased Akt to a slight degree in both cases, probably due to autocrine secretion of growth factors for the 1 or 24 h that the cells were in quiescent media supplemented with pravastatin. Thus, PI3K inhibition may contribute to the anti-mitogenic effect of pravastatin. However, since this molecule has no known farnesylation sites, we hypothesize that it is affected by the statins independently of their prenylation inhibitory property. Since PI3K is activated by proteins in the MAP/ERK cascade (e.g., MEK [(24)]), we next examined the effect of short-term pravastatin on this signaling pathway. PDGF-BB-stimulated PI3K activity is decreased by short-term incubation with pravastatin. VSM cells were grown to confluence in 6-cm plates and serum-deprived as in Figure 1. Cells were exposed to 100 μM pravastatin for the times indicated (in hours) before addition of PDGF-BB (30 ng/ml) (where indicated) for 10 min. Control cells (C) did not receive pravastatin. The cell lysate was normalized for protein content, and equal protein quantities of each lysate were used in each experiment. The lysate was immunoprecipitated with phosphotyrosine antibody. (A) Incorporation of [γ32P]-ATP into phosphatidylinositol-phosphate catalyzed by the lysate was performed, the lipid phase reaction products were separated by thinlayer chromatography (TLC), and the TLC plate was visualized with a PhosphorImager. PIP represents the position of nonradioactive phosphatidylinsitol-3 phosphate visualized by iodine vapor. (B) Densitometry of the phosphatidylinositol-3 phosphate spot was determined by a PhosphorImager and pooled from three experiments. Control cells ([UNK]) were incubated with pravastatin (where indicated) but were not stimulated with PDGF. [UNK], PDGF-stimulated cells. *P < 0.05 relative to PDGF alone. The results shown are representative of three separate experiments. 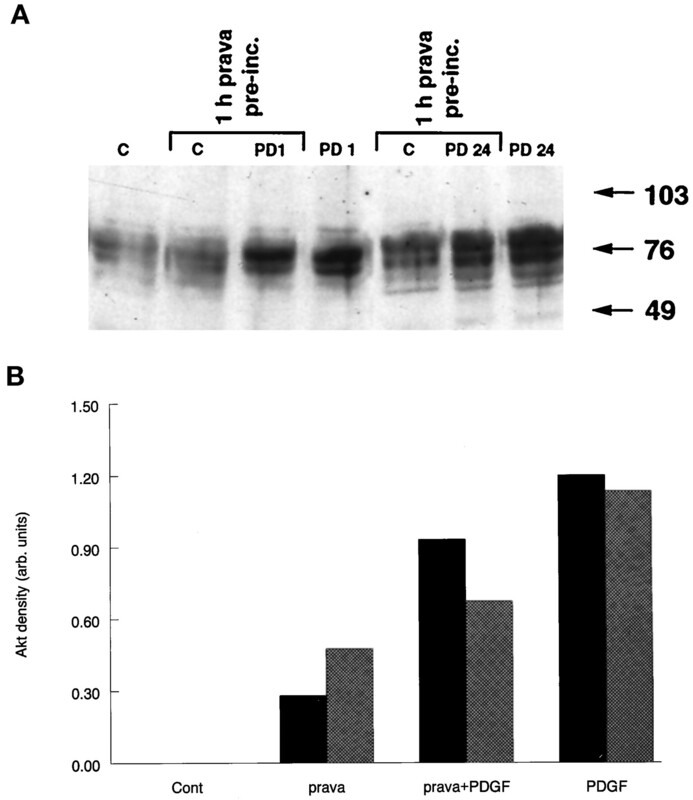 Akt phosphorylation is decreased by 1 h pravastatin preincubation. VSM cells were grown to confluence in 6-cm plates and serum-deprived as in Figure 1. Cells were exposed to 100 μM pravastatin for 1 h and then PDGF-BB (PD; 30 ng/ml) was added for an additional 1 or 24 h. The cell lysate was normalized for protein content, and equal protein quantities of each lysate were used in each experiment. (A) The lysate was electrophoresed and Western blotted with phospho-Akt antibody. (B) Densitometry of the phospho-Akt bands (representing different degrees of phosphorylation) was determined with a Bioimager gel reader. In PDGF-stimulated lanes, cells exposed to 1 h PDGF (▪) and 24 h PDGF ([UNK]) are so indicated. The results shown are representative of two separate experiments. To determine whether elements of the MAP/ERK kinase pathway downstream of Ras are inhibited by short-term pravastatin incubation, we next examined MAP kinase activity after both short and long pravastatin incubation times. MAP kinase lies downstream of Ras and Raf in the MAP/ERK kinase pathway used for mitogenesis by receptor tyrosine kinases (25). Serum-starved VSM cells were preincubated with pravastatin for 1 or 24 h and then exposed to PDGF-BB for 10 min. Active ERK1/2 was immunoprecipitated with phospho-specific MAP kinase antibody and reacted in vitro with its substrate Elk-1 (26,27,28); phospho-Elk-1 was visualized by Western blotting (Figure 6). In agreement with our Ras data, while MAP kinase activation was strongly induced by PDGF-BB, there was no diminution in PDGF-stimulated MAP kinase activity after incubation with pravastatin for 1 h.
Mitogen-activated protein (MAP) kinase activity is not reduced after 1 h of pravastatin preincubation. VSM cells were grown to confluence and serum-starved as in Figure 1. Cells were exposed to 100 μM pravastatin (P1, P3, P24) for the times indicated (in hours) before addition of PDGF-BB (30 ng/ml) (where indicated) for 10 min. Control cells (C) did not receive pravastatin. Phospho-MAP was immunoprecipitated and reacted in vitro with Elk-1 fusion protein as described in Materials and Methods; phospho-Elk-1 was identified by Western blotting and is indicated by an arrow. The thick upper bands represent IgG from the immunoprecipitation. The results shown are representative of three separate experiments. Raf lies in the MAP/ERK kinase mitogenic signaling cascade for PDGF and has been shown to mediate both growth stimulation and inhibition (29), as well as apoptosis (30). We and others have shown that increased Raf activity does not necessarily correlate with either increased cell growth or hyperphosphorylation on an sodium dodecyl sulfate gel (4,31), but the state of Raf activity can offer clues to its mechanism of signaling (vide infra). We thus examined Raf activity and gel mobility after exposure of cells to pravastatin for both short and long periods. Serum-starved VSM cells were exposed to pravastatin for 1 or 24 h and then stimulated with PDGF-BB for 10 min. The lysate was divided in half; Raf activity, using a cascade reaction resulting in Elk-1 phosphorylation, was determined with part of the lysate, and Raf electrophoretic mobility, by Western blotting, with the other. 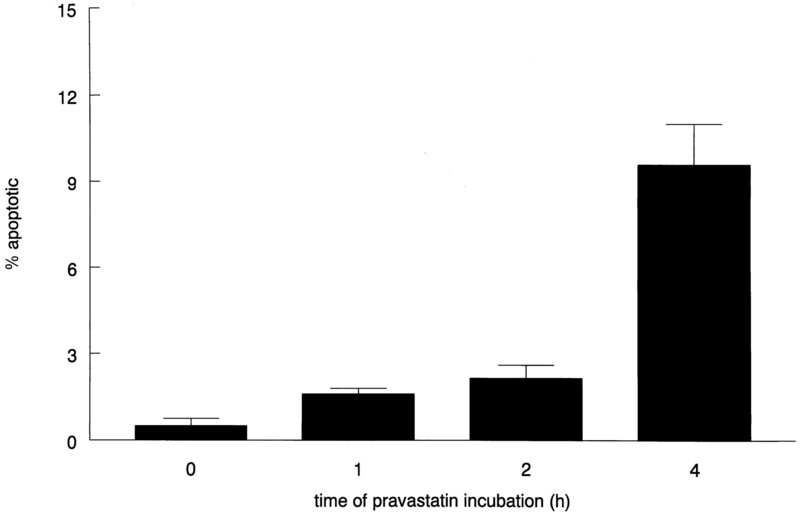 Although the Raf hyperphosphorylation observed after PDGF stimulation was unaffected by pravastatin incubation at all times examined (Figure 7A), Raf catalytic activity was consistently increased by pravastatin (Figure 7B), at both short and long incubation times, in a manner that paralleled growth inhibition (Figure 1). Raf activity was decreased in PDGF-stimulated cells (compared with controls) despite increased hyperphosphorylation, consistent with other reports suggesting that the more highly modified (slowly migrating) form of Raf is actually inactive (4,32,33): Active Raf may in this case be acting as a growth inhibitory signal (4,31), such that inactive Raf allows PDGF to be growth stimulatory under these conditions. Raf activity is increased by pravastatin, with no change in hyperphosphorylation. VSM cells were grown to confluence in 6-cm plates and serum-deprived as in Figure 1. Cells were exposed to 100 μM pravastatin for the times indicated (in hours) before addition of PDGF-BB (30 ng/ml) (where indicated) for 10 min. Control cells (C) did not receive pravastatin. The cell lysate was normalized for protein content, and equal protein quantities of each lysate were used in each experiment. (A) The lysate was electrophoresed and Western blotted with Raf-1 antibody. (B) The same lysate as in Panel A was immunoprecipitated with Raf-1 antibody, and Raf catalytic activity was determined as described in Materials and Methods. The results shown are representative of three separate experiments. We describe above our observation of increased Raf activity associated with growth arrest, and others have shown that such Raf-induced cell cycle arrest is mediated by such cdk inhibitors as p21Waf1/Cip 1 (29,34) and p27Kip 1 (31). Furthermore, since (1) we showed above that Ras inhibition does not account for the effect of short-term pravastatin incubation on cell growth, (2) PI3K has been shown to be dependent on Rho activity (35,36), and (3) Rho is inhibitory toward cdk inhibitors (37,38), we next decided to examine the stability of Rho after 1 h statin exposure. Serum-starved VSM cells were pulsed with [35S]-methionine for 2 h, with pravastatin added for the last hour, and chased with quiescent media in the presence of PDGF-BB for 2 to 4 h (39), and the lysate was then immunoprecipitated with Rho antibody (which recognizes both RhoA and RhoB). After the addition of protein A-Sepharose beads, the lysate was electrophoresed, and the gel dried and autoradiographed. In control cells, [35S]-methionine-containing Rho decreased markedly by 4 h, indicating degradation of this protein as has been reported for RhoB (39). However, the level of [35S]-methionine-containing Rho in the 1-h pravastatin preincubated cells remained constant at 4 h, demonstrating that its stability was increased by pravastatin (Figure 8). We suggest that the increased stability of this molecule is due to the fact that pravastatin allows Rho to remain bound to its inhibitor Rho-GDI (since its lipidation is inhibited), and is therefore resistant to proteolytic degradation (40). Stability of Rho is increased after 1 h pravastatin preincubation. VSM cells were grown to confluence in 6-cm plates. The cells were pulsed with [35S]-methionine for 2 h in methionine-deficient medium, with pravastatin added for the last hour, chased with quiescent media in the presence of PDGF-BB (30 ng/ml) for 2 to 4 h, and the lysate was then immunoprecipitated with Rho antibody. The cells were harvested at the indicated times (after complete medium addition), immunoprecipitated with Rho antibody, and electrophoresed, and the gel was dried and examined with a PhosphorImager. The results shown are representative of two separate experiments. Rho has been shown to suppress transcription of the cdk inhibitor p27Kip 1 to allow Ras to increase transit through the cell cycle (38), and long-term lovastatin has been shown to decrease mesangial cell proliferation through p27Kip 1 induction (41). Other cdk inhibitors, such as p21Waf1/Cip 1, as well as p27Kip 1, have also been shown to mediate growth arrest in situations in which Raf is activated (29,31). We thus examined the effect of short-term pravastatin incubation on p27Kip 1 protein levels. 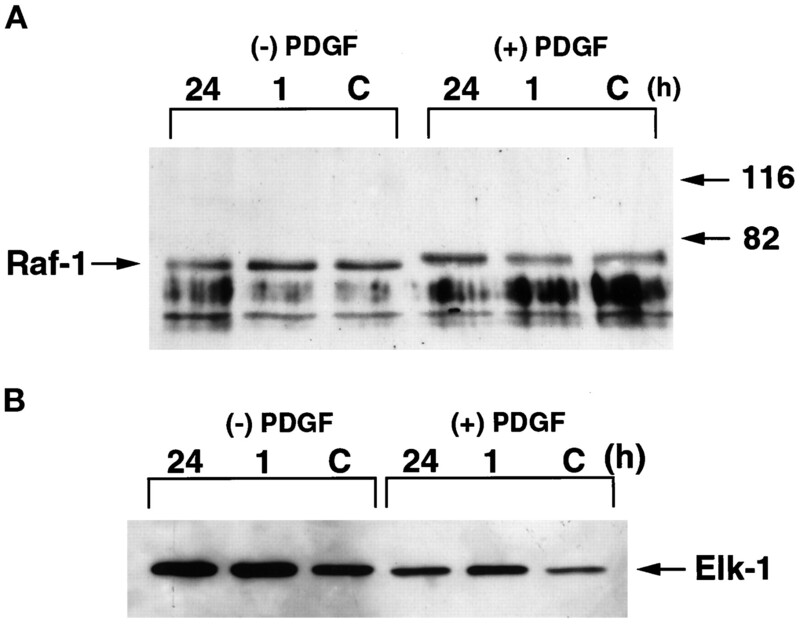 Western blotting of cell lysate with p27Kip 1 antibody demonstrated an increase in p27Kip 1 to control levels when cells were stimulated with PDGF 1 h and 24 h after 1 h preincubation with pravastatin (Figure 9), consistent with this molecule being an effector of Rho (38) and the mediator of arrest of PDGF-induced growth observed in our cells after 1 h pravastatin exposure. p27Kip 1 protein level is increased by PDGF exposure after 1 h pravastatin preincubation. VSM cells were grown to confluence in 6-cm plates and serum-deprived as in Figure 1. Cells were exposed to 100 μM pravastatin for 1 h and then PDGF-BB (PD; 30 ng/ml) was added for an additional 1 or 24 h. The cell lysate was normalized for protein content, and equal protein quantities of each lysate were used in each experiment. The lysate was electrophoresed and Western blotted with p27Kip 1 antibody. The results shown are representative of two separate experiments. Since our initial observation was that PI3K activity was inhibited by short-term pravastatin exposure, we next sought to correlate these data with the mechanism of growth inhibition elucidated above. The C3 exoenzyme of Clostridium botulinum has been shown to catalyze an ADP-ribosyltransferase reaction that interferes with the biologic effects of Rho by ADP-ribosylating and inactivating this small G protein (36,42). VSM cells were scrape-loaded with C3 exoenzyme as has been described (a procedure that loads >80% of cells with C3 [(43)]), and PI3K activity was assessed both with and without stimulation by PDGF-BB. Because the cells did not tolerate serum starvation after scrape loading, basal PI3K activity was not absent in the PDGF nonstimulated cells (since they were not serum-starved). Although PDGF-BB increased PI3K activity in the non-C3-loaded cells, those cells scrape-loaded with C3 isoenzyme demonstrated no PDGF-BB-mediated increase in PI3K activity (Figure 10), supporting our supposition that the decreased PI3K activity observed with short-term pravastatin incubation is in fact due to Rho inhibition. PDGF-stimulated PI3K activity is decreased by C3 exoenzyme. VSM cells were grown to confluence in 6-cm plates and serum-deprived as in Figure 1. Non-serum-starved cells were scrapeloaded with C3 exoenzyme (where indicated) as described in Materials and Methods and grown overnight. After stimulation with PDGF-BB for 10 min, cells were lysed, equal protein quantities of lysate were immunoprecipitated with anti-phosphotyrosine antibody, and PI3K activity was determined. (A) Incorporation of 32P into phosphatidylinositol-phosphate, catalyzed by the lysate, was performed, the lipid phase reaction products were separated by TLC, and the TLC plate was visualized with a PhosphorImager. PIP represents the position of nonradioactive phosphatidylinositol-3 phosphate visualized by iodine vapor. (B) Densitometry of the phosphatidylinositol-3 phosphate spot was determined by a PhosphorImager and is expressed as the fraction of control density and the range of the two experiments. [UNK], cells stimulated with PDGF. ▪, control cells not stimulated. The results shown are representative of two separate experiments. The activated Raf (44) and PI3K/Akt (22) pathways described above have been shown to mediate apoptosis, which may be the mechanism of the anti-mitogenic, as well as the myopathic, effect of the statins. To examine whether shortterm pravastatin is also capable of mediating this effect in our cell line, we performed in situ TUNEL assays. We consistently found apoptosis with short times of pravastatin incubation, with approximately 10% apoptosis after only 4 h of pravastatin incubation (Figure 11). Apoptosis is induced by pravastatin at short times. Non-serum-starved VSM cells were grown on glass coverslips, incubated with pravastatin (100 μM) for the times indicated, and subjected to in situ terminal deoxynucleotidyl transferase-mediated nick end labeling assays. The results are mean of apoptotic cells per plate and the range of two separate experiments. We report here a novel finding that PDGF-BB stimulation of DNA synthesis is attenuated by an HMG-CoA reductase inhibitor when VSM cells are incubated for only 1 h before growth factor stimulation. We show, consistent with work from other investigators (8,10), that this is insufficient time for abolition of Ras activation. Rather, our data indicate that this antiproliferative effect correlates with increased Raf activity and is most likely due to increased levels of the cdk inhibitor p27Kip 1 mediated by decreased Rho and/or PI3K activation (Figure 12). Our finding that p27Kip 1 is increased when the cells are stimulated by pravastatin is consistent with other reports of Raf-mediated cell cycle inhibition mediated by the cdk inhibitors p27Kip 1 (31,45) and p21Waf1/Cip 1 (29,34). We found that PI3K activity is decreased after short-term pravastatin incubation, an effect that we also show to be likely mediated by the effect of HMG-CoA reductase inhibition on Rho. 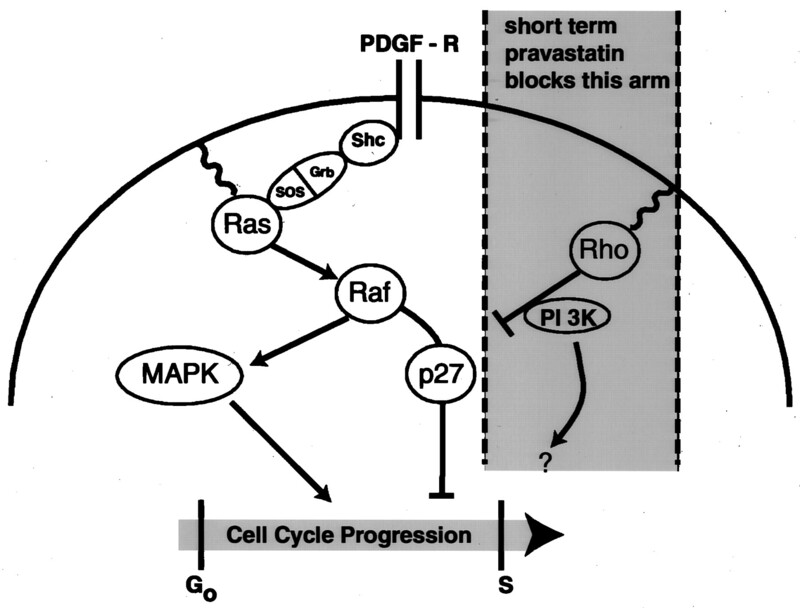 Since the PDGF receptor requires PI3K for its mitogenic effect (18,19), it is unclear whether the cell cycle arrest induced by short-term pravastatin incubation is mediated directly by p27Kip 1 or through an effect on PI3K. Ras-independent inhibition of growth by short-term pravastatin is via Rho and PI3K. Short-term incubation of VSM cells with pravastatin likely inhibits growth through the scheme described in the shaded part of the figure. Short-term pravastatin increases Rho stability, probably as a result of its decreased lipidation and consequent association with Rho-GDI. This leads to inhibition of PI3K activity, an event that is reproduced by inactivation of Rho by C3 exoenzyme. The release of tonic inhibition on p27Kip 1 from Rho and/or PI3K causes increased p27Kip 1 activity, leading to inhibition of cell cycle transit. Raf and MAP kinase were not inhibited by short-term pravastatin. PDGF-R is the PDGF receptor. Our data showing that ADP-ribosylation of Rho (by C3 exoenzyme) inhibits PDGF-BB stimulation of PI3K activity are consistent with work from other laboratories (35,36), but the mechanism by which Rho influences PI3K remains obscure and was not investigated here. Because of its role as an organizer of the actin cytoskeleton, it is possible that Rho may be functioning as a membrane-directing element in the signaling cascade of PI3K, such that the non-lipidated protein may prevent some PI3K molecules, despite functional src-homology domains, to be directed to activated growth factor receptor. However, PI3K is unlikely to be the sole mediator of growth inhibition by short-term pravastatin. Based on our data showing that p27Kip 1 protein levels, attenuated by PDGF stimulation, are increased to control levels after 1 h of pravastatin preincubation, we believe that the Rho/p27Kip 1 pathway may play a role at least equal to PI3K inhibition in the events leading to cell cycle arrest mediated by this drug. Our finding that growth suppression is not complete with short-term, highdose pravastatin is not inconsistent with our proposed mechanism. Many cells have evolved multiple and redundant pathways for growth control, and we believe it is likely that some of these other cascades may come into play when both PI3K and Rho are modulated as we have described. Of course, another possibility is that we have not completely inhibited PI3K, or maximally stimulated p27Kip 1, with the doses of pravastatin used. We found no effect of short-term pravastatin on both PDGF-β receptor autophosphorylation and MAP kinase activation, suggesting that the “classical” MAP/ERK pathway is not involved in growth inhibition under these circumstances. Others have shown that tyrosine phosphorylation of the insulin receptor and IRS-1 is inhibited by overnight lovastatin incubation (46). Although we did not find this to be the case for the PDGF receptor in our short-term pravastatin studies, that data affirm that there exist non-lipidation signaling events, such as possibly a direct effect on PI3K, that may be affected by the statins. Another group has shown that phosphatidylinositol-3,4,5-P3, the in vivo product of PI3K, may act to recruit SH2-containing proteins to the plasma membrane, suggesting a means by which PI3K could be contributing to the assembly of signaling proteins to the membrane (47); whether this action in some way involves lipidation is not known. There are other reports of Ras-independent mitogenic inhibition by an HMG-CoA reductase inhibitor, but this phenomenon was reported in NIH-3T3 cells transformed by oncogenes, and was examined after 2 to 3 d of lovastatin incubation (48). Other investigators have shown that newly synthesized RhoA, not Ras, is the moiety that is involved in cell cycle progression due to a variety of growth stimuli (49). These authors are in agreement with our findings that membrane-associated Ras is not altered by pravastatin. Other investigators have shown that Rho processing is affected by the HMG-CoA reductase inhibitors, but there are conflicting data regarding the effect of pravastatin. One group showed that the reappearance of membrane-bound RhoA after growth stimulation of FRTL-5 cells was blocked by 36 h of pravastatin incubation (49), while another group showed that RhoB prenylation was unaffected by 24 h incubation of rat VSM cells with this drug (although prenylation was affected by other statins) (50). Our finding that the stability of Rho is increased by short-term statin incubation, likely due to its complex with Rho-GDI and thus resistance to proteolysis (40), is consistent with a short-term pravastatin effect on this GTPase. Other investigators have shown similar statin effects on p27Kip 1. Pravastatin reduced p27Kip 1 degradation in FRTL-5 cells (45) and increased p27Kip 1 protein levels in mesangial cells (41), and lovastatin increased p27Kip 1 protein but not mRNA in HeLa cells (51). The latter authors show a modest increase in p27Kip 1 protein less than 2 h after release from G1, consistent with our finding of rapid induction of this protein with pravastatin. Our finding of apoptosis induced by pravastatin is consistent with other reports of statin effects in VSM cells (50,52). The latter authors did not observe apoptosis with pravastatin; however, these investigators used only morphologic criteria and flow cytometry rather than TUNEL assays. Other investigators have demonstrated apoptosis induced by long-term exposure to the farnesyltransferase inhibitors (53). In our VSM cells, we believe that the PI3K arm of the signaling pathway affected by pravastatin may be responsible for mediating apoptosis. Our finding of decreased levels of Akt after both short- and long-term pravastatin incubation is consistent with other reports of Akt mediating survival and its inhibition, apoptosis (22,23). Whether the apoptosis observed with statin incubation contributes to the myopathic effect of the statins, the most common adverse effect seen especially at high doses (54), is a distinct possibility based on our new data and remains to be explored. Our data thus demonstrate a novel mechanism by which the statins are capable of inhibiting receptor tyrosine kinase growth factor mitogenic signaling. This short-term pravastatin signaling pathway is probably separate and independent of long-term statin-induced inhibition of Ras farnesylation, which has been well described (55,56) and is likely independent of anti-lipidation effects. The novelty of our results is that we find an acute inhibitory effect of pravastatin on a key, non-Ras mitogenic signaling pathway. Our finding that short-term pravastatin incubation at high concentrations (the concentration of 100 μM used in these studies is 667 times higher than the “therapeutic” Cmax in humans [(57)]) causes Ras-independent VSM cell growth arrest as well as apoptosis has seminal implications in the treatment of a number of disparate disorders. For example, pravastatin could be applied locally at high concentrations during angioplasty to prevent the common complication of restenosis without toxicity associated with long-term Ras inhibition in normal cells. In addition, since hemodialysis access stenosis has been shown to involve aberrant VSM cell proliferation, especially at the venous anastomosis, statins may prove useful as therapy for this disorder. Our work on the effect of short-term, high-dose statins on mitogenic signaling pathways may prove clinically useful as therapy for VSM-mediated processes such as angioplasty restenosis and hemodialysis vascular access failure. To confirm the feasibility of such supra-therapeutic doses in humans, a recent Phase I clinical study showed minimal toxicity of high-dose pulsed lovastatin (approximately 45 times the normal therapeutic doses [(54)]), the dose-limiting effect being myopathy. Since we now show that the anti-mitogenic, as well as possibly the myopathic, effect of high-dose statins are associated not with Ras inhibition, but rather with cdk inhibitor induction, PI3K inhibition, and Rho modulation, other agents that are more specific to these signaling pathway and that do not affect Ras could be developed using this new paradigm. This work was supported by the Research Service of the U.S. Department of Veterans Affairs, by a grant from the National Kidney Foundation, and by a gift from Dialysis Clinics, Inc. We thank Anitha Toke and Tina Chang for technical assistance. Inflammation, Immunity, and HMG-CoA Reductase Inhibitors: Statins as Antiinflammatory Agents?